Don't limit packed meals to rice-and-viand bento boxes. Give your little one an extra boost with something sweet! How about preparing strawberry mango Nutella french toast rolls for dessert or snacks? All the kids will want a taste of your child's baon! 2. In a bowl, mix the eggs, milk, salt and cinnamon using the Chef's Classics wire whisk. Set aside. 3. Use a rolling pin to roll the bread flat. Spread ½ spoon of Nutella on each piece of bread. 4. Sprinkle mango and strawberries along the bottom part of the bread. 5. Roll up the bread. The Nutella will keep the bread sealed. Roll each bread to the egg mixture, shake off the excess then place it in the pan. 6. 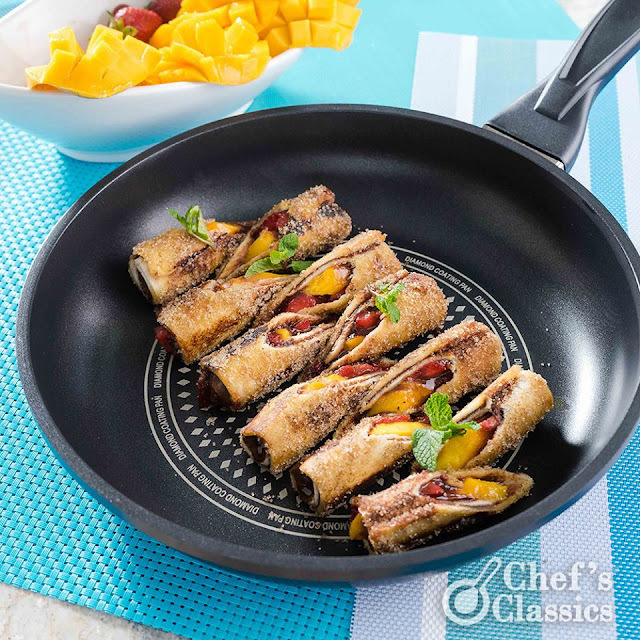 In the Chef s Classics Hibiscus Frypan, melt the butter in medium to high heat. Cook the rolls for about 3 minutes or until it's golden in color. Set aside. 7. In a bowl, combine the caster sugar and cinnamon. Use this mixture to coat the bread rolls. 8. Serve it with whipping cream if available.